We all know that desks usually mean homework and studying, however these 15+ kids desks will not be making you feel that way. They are colorful, fun, simple. Kids would love these desks in their rooms, they are inspiring! I love this built in desk in the corner, it offers a lot of storage and it is perfect for a sophisticated girls room. This polka dot desk is so simple but so fun, find some similar on etsy. This refurbished desk is darling, you can get a great look for what fits your kids room when you paint it yourself. I love the antiqued look of this desk, especially with all the maps and vintage suitcases. This may be a simple desk but it looks so cute with a colored desk chair and some decorations here and there. This super simple desk would be perfect in a little room. I love the white with pops of color, the chairs are so fun for a kids desk. Okay I love everything about this desk and room. The wild and loud colors are so fun, and the different patterns seem to work so well together. I would LOVE a hot pink desk and floral chair. Spice up a desk with some paint or as seen here you can add some polka dots and color! The way the desk is built on to the end of the bed is really nice, I love the green! So what I love about this desk is its simplicity, because of that you can really go full out on the walls with any color and any pattern as seen here. This crib was repurposed into a desk, I love the chalkboard idea as well, perfect for an art center. What do you think about this unique idea, a box hanging from the wall as a desk? I like it! I love the idea of putting the desk in the closet, especially if you have messy kids, just close the door and the mess is gone! The boxes on this desk are a great way to keep things organized, they turn into wonderful shelves. I love finding these vintage desks at the thrift store, they are always fun to refurbish. 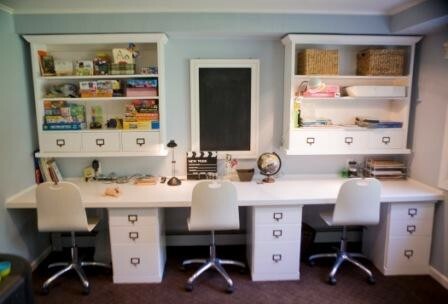 Here is another great “Homework Station” and “DIY Wall Desk”.